As an experienced home decorator who’s remodeled Hampton real estate for the Easter holidays, I can safely admit it’s one of my favorite holidays. It’s spring, and the decorations play up the lightness, hopefulness and newborn beauty of the season. Decorating outdoors for Easter actually begins in the fall, for that’s when the daffodils are planted on the clients’ property. There are thousands of varieties of daffodils and their close relatives, narcissus. By Easter they fill the yards with white and yellow blooms. Best of all, they’re deer resistant! The bulbs should be planted twice their depth in rich soil, though some people follow the rule of three: the hole is three inches deep, three inches wide and three inches from the next bulb. Another interesting idea for the exterior of the house is to line a path to the front door with votive candles and pots of Easter lilies. If the house has a porch or a veranda, the candles and Easter lilies can also continue along the edge of the porch. The effect is especially mesmerizing at twilight. A wreath of Easter lilies or other spring flowers like grape hyacinths and daffodils can be hung on the door or in the windows as well. Many creative things can be done to the house’s interior. Small Easter baskets made out of willow twigs and sphagnum moss and filled with glitter eggs can be put on side tables, on mantels and as part of the decoration of the dining table. Chocolate bunnies can have golden ribbons around their necks and also be used as objects of art before they’re eaten. Of course, the daffodils that grow so abundantly in the yard can be gathered and put in small bowls or arranged on epergnes. Marshmallow chicks placed on serving platters, silver bowls of jelly beans and more bowls of daffodils can be arranged among the dessert dishes on a dessert buffet. Decorated Easter eggs can also be arranged in the family’s best crystal compotes and punchbowls and placed among a collection of vintage bunnies on a coffee table. Silhouettes of Easter bunnies or chicks can be scissored out of pastel construction paper and strung on pastel colored thread and hung in the rooms like festoons. There are of course all kinds of ways to dye and decorate Easter eggs. They can be colored the usual way, with vegetable dye and vinegar. They can be marbleized, or decorated with glitter, or painted with intricate patterns. 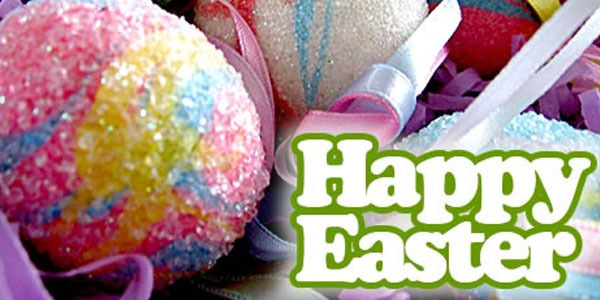 Styrofoam eggs can be wrapped with pearlized thread and papier-mâché eggs can be made to hold tiny gifts of gold beads, jellybeans, tiny chocolate eggs or even fuzzy pompom chicks. There are so many bright and beautiful things that can be done for Easter!